Kids, teens, young adults and parents all seem to enjoy my “what’s in my pack” game. With a fictitious story of having to carry necessities for safety and comfort in my daypack for a full day of snowshoeing on trails in the backcountry, I ask the audience what I should have in my pack. With an actual pack in hand filled with essential items, one of those items is my homemade snowshoe repair kit. Other items I pull from the pack include a compass, map, knife, whistle, first aid kit, matches and fire starter, sunglasses and sunscreen, space blanket, headlamp, extra gloves, cap and socks, rope, water bottle, small gas stove and metal cup, and some food. But since nobody ever says that I should carry a field repair kit, it is always the last item I pull from my daypack when playing this demonstration game. I then point out some scenarios when a repair kit would come in handy. 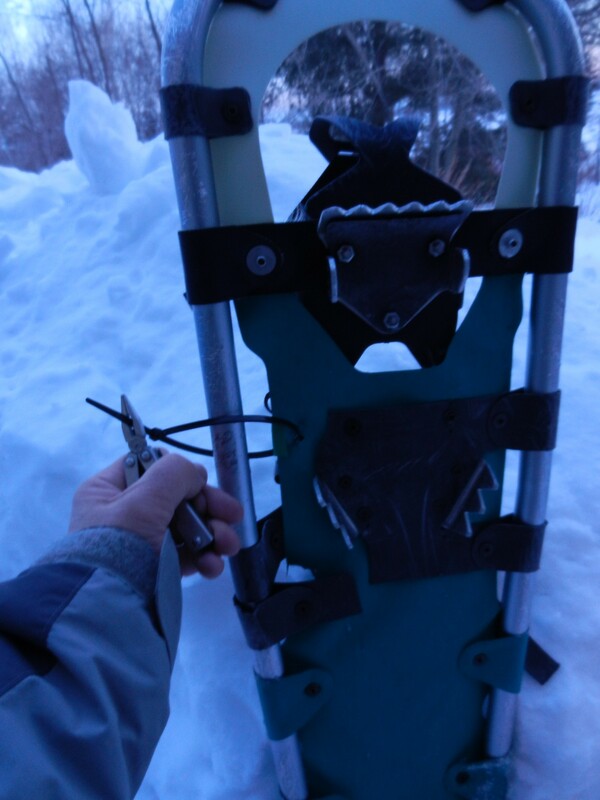 For example I ask, what would you do if one of your bindings break and you can no longer attach your feet to one of your snowshoes…and you have a foot of snow to travel on to get back to the trailhead a mile away? What if you bridge one of your snowshoes on a log and your frame (wood or aluminum) breaks in half? The first prerequisite when creating a snowshoe repair kit is to get to know your snowshoes. 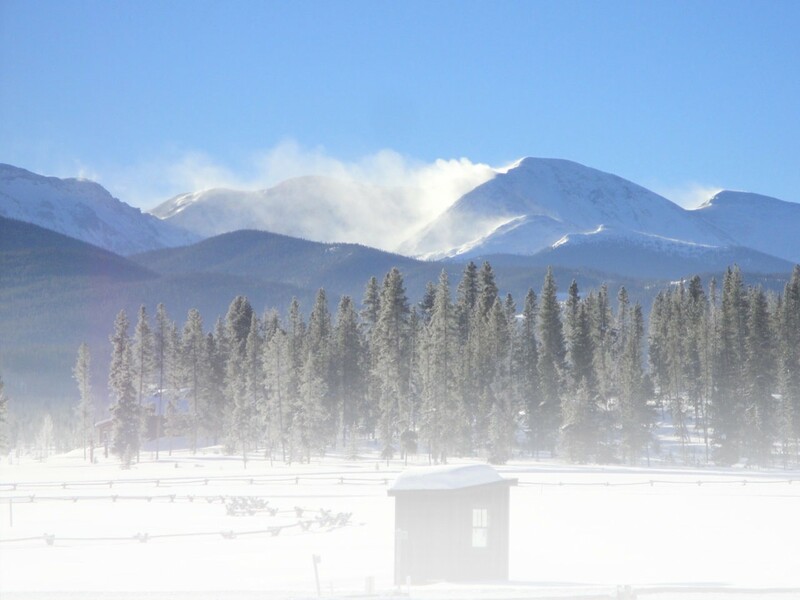 Learn about the materials your snowshoes are made of. Identify what could potentially go wrong with the shoes. And know what snowshoe parts could break and what parts should you make handy in case they do break. Can you get those parts from your snowshoe company? The more you learn about your snowshoes, the better prepared you will be to treat them in the field should something break. Look at the frame, be it wood on tradition snowshoes or aluminum. Rarely do frames break. The most common breaks however, come from bridging a snowshoe on or across a log or rock. But if a frame does break, a method for a temporary field repair would be to create a splint out of metal or wood and connect the splint to the remaining frame with cord, wire, clamp, duct tape or all of the above. Should a hypalon deck of an aluminum frame shoe tear or break away from the frame, there are a few options to consider in making the repair. Use either plastic cable ties or wire to reattach the two together. Duct tape works well for temporarily mending tears in the deck’s fabric. Pivot systems can be simple or complex, depending on the type of snowshoe. Sometimes a simple nut and bolt, or aluminum wire can fix the problem in the field, depending on the extent of the breakage. Broken bindings can be a major problem, since the function of the binding is to attach the snowshoe to your foot. The use of a fabric strap, webbing, mesh or other thick material can help to temporarily affix the shoe to your boot or shoe. This involves a combination of creativity and some engineering ingenuity. Take your time, plan and prepare a solution. What’s in my homemade repair kit? Now that you got to know your snowshoes, considered some scenarios that could go wrong when snowshoeing on the trail, and what you can do to solve the problem; now consider what you should put into your homemade snowshoe repair kit. Plastic carry case – I use a quart-size heavy-duty zip-lock plastic bag. Use a small plastic container with a lid, or an old fanny pack…any of these will work to house your repair supplies. Wire & plastic cable ties/zip-ties – I carry about a dozen 10-inch plastic cable ties and about 3 feet of aluminum wire. These items can be helpful in many repair situations. Hose clamp – A hose clamp, like the one you would use to connect a hose in your car or for pluming, can come in handy for fixing a broken frame by clamping on a tent stake or stick. Metal or strong aluminum tent stakes – A tent stakes will serve as a splint for a broken frame. Bootlace / fabric strap with clip / webbing / mini-bungees – Any of these items can help with a binding repair. The bootlace can also work for attaching decking to a frame, or of course for replacing a broken lace on your boot. Nuts, bolts and washers – These items can be used for attaching a traction device to a pivot system or deck; or for replacing a broken rivet on the snowshoe. Duct tape – Canada’s Red Green says that duct tape is the “handyman’s secret weapon.” Using duct tape for most snowshoe field repairs is a way to show you are handy (be you a handyman or handywoman). Duct tape can be used for adhering to decking, bindings and frame. Multi-tool or knife with many tool features – I carry a small multi-tool that includes pliers, Phillips and standard screwdriver, and more. A Swiss Army knife for example, also has multiple tool options on it. These two tool devices will help with repair that requires screwing, tightening, twisting, bending, punching and cutting. Parts from snowshoe manufacturer – The last thing to add to your repair kit if available, are any items you can secure from your snowshoe company. Order any auxiliary parts they may sell that would help with field repairs. For example, MSR sells a “Snowshoe Maintenance Kit” that includes such items as clevis pins, split rings, washers, lock nuts, strap retainers and more. 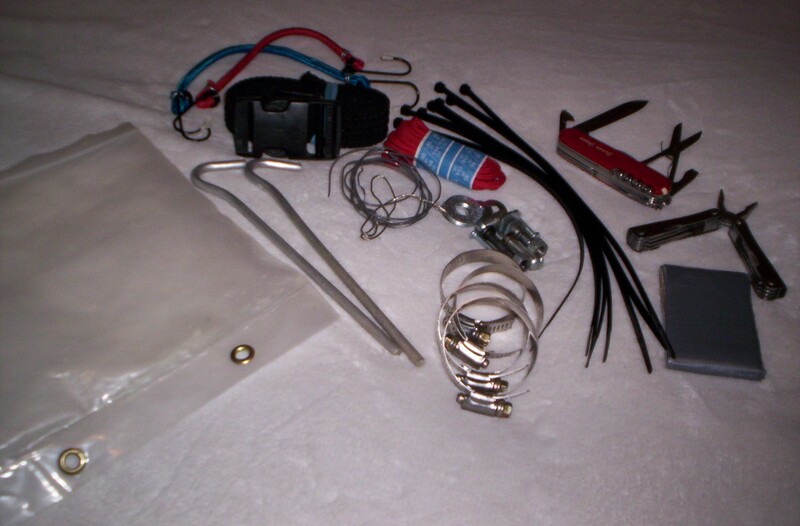 If you own MSR snowshoes, consider adding this kit to your homemade kit. I once taught a winter backpacking course where students hiked to our campsite using snowshoes. One of the student’s snowshoe binding broke away from the frame at the toe hole on their plastic snowshoe. In my tent that night, I carefully taped the binding to the frame with numerous wraps of duct tape. Once I got the duct tape to hold onto the two components, the re-wrapping of the tap onto itself held that binding in place through the rest of our trip. I was amazed at the power of duct tape. Red Green would have been proud! When heading out on the trail for a day of snowshoeing, take your homemade snowshoe repair kit. You should never leave home without it. “If they can’t find you handsome, they should at least find you handy.” great show! I snowshoe on odd terrain alone so much I must have a snowshoe kit like yours with me always. If I am not camping or not needing tent stakes, I prefer to cut a chunk of semi bendable wood put into the broken frame tube and hose clamp it up with tape underneath. Besides an outside metal splint I have used an aluminum bendable frame piece from my pack, but that was an extreme circumstance . I also take Gorilla tape to go over the duct tape and make repairs or replacement parts that take a lot of weight bye attaching the tape to itself.